This Lambert kay Fresh 'n Clean scented shampoo creates a pleasing fragrance that lasts from one grooming session to the next. Long-lasting scent refreshes instantly by wiping the pet's coat with a moist towel. 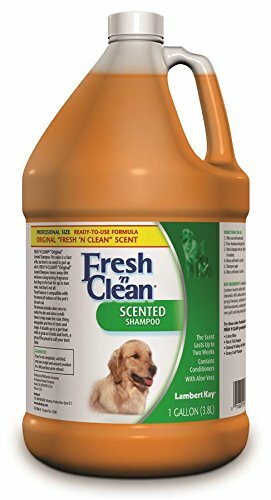 Keeps dogs smelling fresh and clean for weeks. Shampoo helps remove mats and tangles. Contains antistatic agents to leave coats manageable. Safe for use on dogs and cats. Not recommended for Persian cats. Convenient, ready-to-use formula. Ingredients are sodium laureth sufate, disodium oleamido mea, sulfosuccinate, cocomidopropyl betaine, cocomide dietanolamne, aloe vera gel, fragrance. Directions for use - Wet the coat with warm water. Pour shampoo along pet's back. Work shampoo into coat. Add more if needed. Rinse. Shampoo again. Rinse until water is free of suds. Available in 1-gallon. Measures 12-inch length by 6-inch width by 6-inch height.